Christie’s Modern & Contemporary Arab, Iranian and Turkish art sale took place in the Emirates Tower in Dubai on the 18 March 2015. The overall auction season of Modern and Contemporary Arab, Iranian and Turkish art raised $9,250,000 (all figures are excluding buyer’s premium), at the upper end of the pre-sale auction expectations of $7,151,000 to $10,095,000. 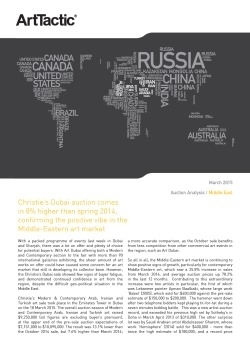 The result was 13.1% lower than the October 2014 sale, but 7.6% higher than March 2014; a more accurate comparison, as the October sale benefits from less competition from other commercial art events in the region, such as Art Dubai. So all in all, the Middle-Eastern art market is continuing to show positive signs of growth, particularly for contemporary Middle-Eastern art, which saw a 25.8% increase in sales from March 2014, and average auction prices up 78.2% in the last 12 months.